Fishermen and spectators came together on Grand Isle, LA this past weekend to be a part of the 34th Annual Creole Classic Fishing Tournament, three days spent hoping to catch “the big one.” This annual event helps raise money for local charities while also giving thousands of outdoor enthusiasts an excuse to have fun on the coast. Held at the Bridge Side Marina in Grand Isle, the fishing tournament awards prizes in adult, child, and sponsor categories for fish like flounder, speckled trout, and bull red. While participants spend their days on the water, in the evenings they gather at the marina to weigh their catch, listen to music, and enjoy Cajun food. This year the Creole Classic added a children’s activity area on Friday evening, coordinated by Restore or Retreat. Coastal Wetlands Planning, Protection, and Restoration Act (CWPPRA) outreach staff set up the “Mysterious Wetland Wonders” activity, inviting kids (and adults) to guess the plant or animal relic (like an oyster shell or cypress knee) in the box by reading clues and feeling it with their hands. Kids also created Wilson’s plover chicks with LA Audubon and made prints of starfish and fish with Restore or Retreat. CWPPRA staff also had Protect Our Coast posters, WaterMarks, and Henri Heron Activity books available. Coastal wetlands provide important habitat for a variety of fish species, helping Louisiana maintain its place as Sportsman’s Paradise. Unfortunately, these habitats are disappearing as erosion and subsidence take their toll on the coastal zone. 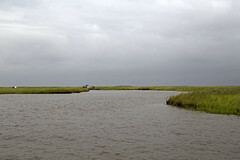 CWPPRA works with our partners to protect and rebuild coastal wetlands so that fish, and the fishermen who pursue them, have a place to live and play.